Relatives: T’Challa/Black Panther (Father), Azzari the Wise (Great grandfather), S’yan (Uncle), T’chaka (Grandfather), Shuri (Aunt), White Wolf (adopted Uncle), Jakara (Uncle), T’shan (Cousin), Bashenga (Ancestor). Skills and abilities: Trained in Wakandan martial arts since birth by the finest teachers and his father. Powers: None. Since he never ingested the heart shaped herb. 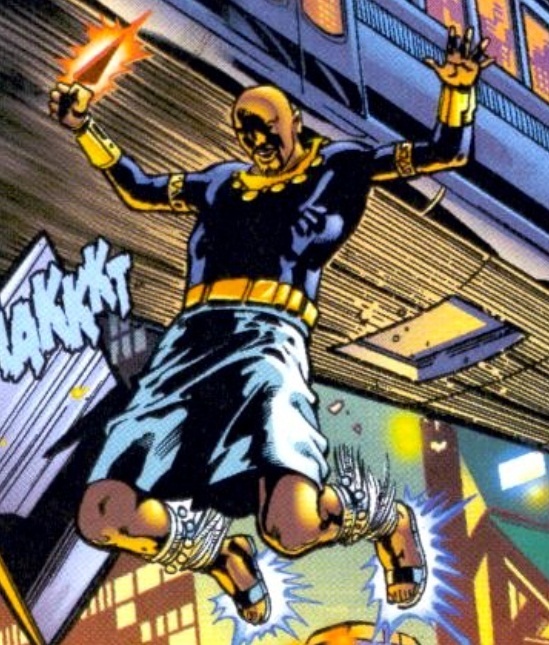 Dutiful, though seen as weak willed, son of T’challa and an unnamed female. Groomed as the crown prince of wakanda since birth, he was sent to America to learn just a his father had. Unknown to all he hatched a plan involving freeing Killmonger from stasis and setting him loose in America to gather old panther foes and capture Everette Ross. When adopted sister Faida and uncle hunter got involved he moved up his plans and murdered Killmonger, Hunter and even Faida. He left her body for his father to find and eventually battled him over ruling Wakanda. He lost and was taken back to wakanda where his fate remains unknown.